‘Korvar’ ancestor figures produced in Cendrawasih Bay like this one would have been used to summon and temporarily house the spirit of an ancestor who may be called upon to adjudicate a matter or to ensure success in a certain venture. 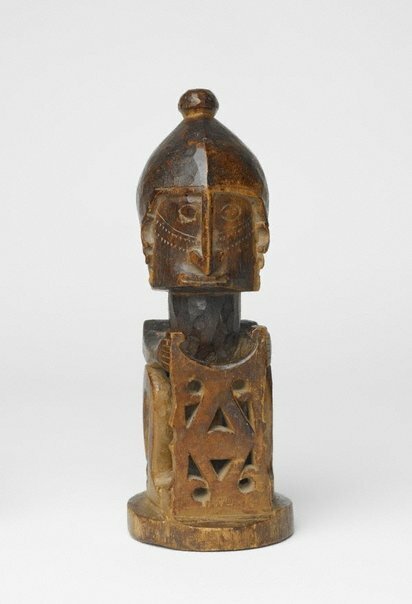 This figure would have been carved by a shamanic practitioner following the death and funerary rites of an esteemed family member or community leader. The ancestral spirit would have been invited to inhabit the sculpture, which acted as a temporary earthly abode for the deceased. The process is accompanied by specific rituals, after which the family of the deceased wraps the sculpture in cloth and store it in the family house. The figure is brought out before important undertakings, such as a battle or extended fishing trips. The priest taps the ‘korvar’ on the ground to bring the ancestor spirit into the image, explains the plans to the spirit and inquiries about the outcome. The ‘korvar’ is then re-stored after this ceremony. After a number of new ‘korvars’ are made, family members take the older examples to the cemetery and place each with the skeleton of the person for whom it was carved. While this figure holds a shield, others sometimes hold the skull of the deceased which is believed to accommodate the spirit and sometimes a snake is present to represent powers of rejuvenation. On the Tanibar Islands in south Moluccas similar ancestor figures exist that are formally comparable with the ‘korvar’ made by Biak people of New Guinea. Like the ‘korvar’ these figures known as ‘Iene’ are depicted squatting with their arms resting upon their bent knees-sometimes they hold a carved shield or emblem and can appear with a single earring pendant in either ear. Sam Dubiner, 1950-1998, New York/United States of America, purchased from J.J. Klejman Gallery. Sam Dubiner migrated to Israel and the object was displayed at the Tel Aviv Museum until 1998. Mariann Ford, May 1999, Sydney/New South Wales/Australia, purchased from Gabriella Roy of Aboriginal & Pacific Art (art dealership). Gift to the Art Gallery of New South Wales as part of the Christopher Worrall Wilson Bequest 2010. Ancestral art of the Indonesian archipelago , Sydney, 2017, 31 (colour illus. ).